BONDED LAMINATED ALUMINUM TAPE, 60% BRAID, LAMINATED ALUMINUM TAPE, 40% BRAID, FLOODED for Weather, PVC JACKET. 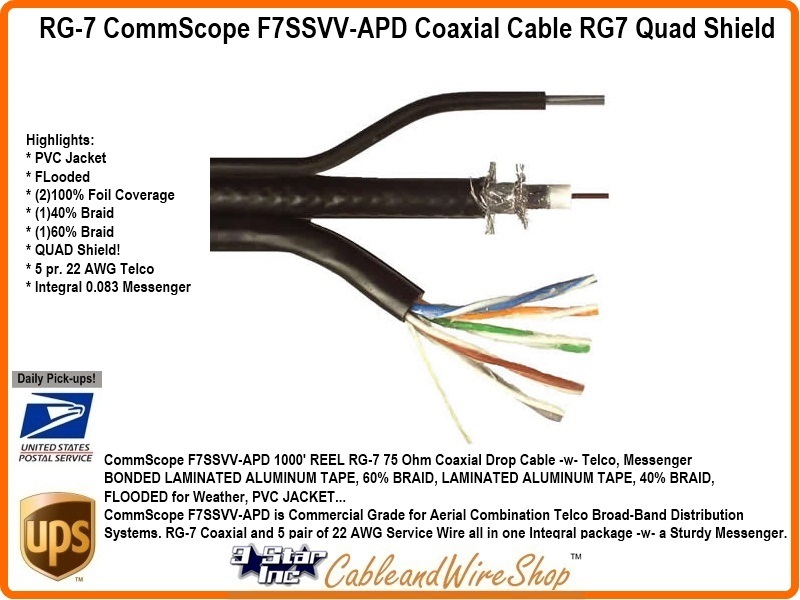 CommScope F7SSVV-APD is Commercial Grade for Aerial Combination Telco Broad-Band Distribution Systems. RG7 Coaxial and 5 pair of 22AWG Service Wire all in one Integral package with a Sturdy Messenger. Note: SuperShield (Quad Shield) - Taking the Tri-Shield construction one step further, this construction adds an additional layer of shielding braid to provide the greatest strength, durability and immunity from network interference. Provides low attenuations for service drops greater than 150 feet in length. Quad Shield Provides Maximum Shielding Integrity in a Pliable Coaxial Drop Package. This is the same Commercial Grade Low Loss Cable your local Cable TV company uses to get from the Telephone Pole to your House. Our Customers use this in their MHP Hotel Motel SMATV Cable TV, Video Surveillance and Hi Speed Internet Systems to distribute around Larger Properties. Cat5e cable is still limited to a maximum of 328 ft (100 m) in length that should include the length of patch cables that interconnect equipment. Cat 5e cable performance characteristics and test methods are defined in TIA/EIA-568-B.2-2001. Cat5e solid conductors are for distribution (typically) whereas Stranded conductors are usually reserved for flexible needs such as patch cords and cables. When using LAN (Local Area Network) cable such as this is used in areas of likely ambient interference that would slow performance from the 350 MHz bandwidth and degrade 100 Mbps (100BASE-TX) potential performance, then SHIELDED Cable is recommended. If the cable is run near or in Air handling spaces, then you should check the local building codes pertaining to Plenum cable use as each jurisdiction can be different in definition and guidance. Riser rating is something recommended as a minimum for all interior (in wall) use. CM is for exposed runs and CMX is exteriror rating, though not necessarily UV ray resistant to degradation.